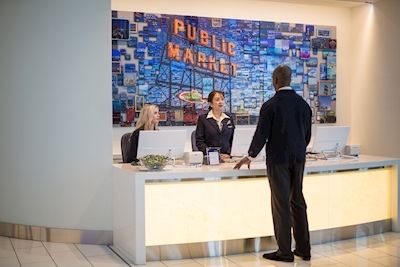 Delta's most-awarded Delta Sky Club took home another win this weekend. The Delta Sky Club at Seattle-Tacoma International Airport was named "North America's Leading Airport Lounge 2018" for the second year in a row by the World Travel Awards, based on votes from travel and tourism professionals and consumers across the globe. This marks four wins for the Seattle Club over the past 16 months. "We are honored to receive this award for the second year in a row that recognizes the exceptional experience at our Delta Sky Club in Seattle," said Claude Roussel, Delta's Managing Director – Delta Sky Club. "We are constantly striving for new ways to improve our guests' experience, and we are proud of the team and world-class offerings at our Seattle Club." Seasonally rotated, locally inspired fare created in partnership with Seattle chef Ethan Stowell. A Pike Place-inspired pixelated mural by Craig Alan McMillan and 60-foot suspended sculpture created by Paul Vexler. Relaxing spa services from Asanda Spa Lounge, with options ranging from a massage in a zero-gravity chair to guided relaxation experiences designed for travelers with Dr. Deepak Chopra world-renowned pioneer in mind-body medicine and a leader in the global wellness movement. Large, energy-efficient, intelligent-tinting windows, featuring View Dynamic Glass which keep the Club temperature and sunlight at optimal levels, eliminating glare and the need for blinds or shades. "Congratulations to Delta for its continued efforts to raise the bar and provide guests with an enjoyable experience," said Graham E. Cooke, President and Founder, World Travel Awards. "As a leader in domestic and international travel, their achievements exemplify all that the airline has to offer – in Seattle and beyond." Over the past two years, Delta has focused on enhancing the customer experience at Delta Sky Clubs across its network. Delta announced new Delta Sky Clubs coming to Austin-Bergstrom International Airport and Phoenix Sky Harbor International Airport in 2019; debuted renovated Delta Sky Clubs at Ronald Reagan Washington National Airport, Newark Liberty International Airport and Minneapolis –St. Paul International Airport; expanded the Delta Sky Club at Raleigh-Durham International Airport; and opened new flagship Delta Sky Clubs at Hartsfield-Jackson Atlanta International Airport and Sea-Tac. Delta also unveiled Asanda Spa Lounges at ATL, SEA and JFK so guests can rest and recharge during their travels. In the past 16 months, Delta Sky Club at Sea-Tac took home four industry awards, including the coveted International Yacht and Aviation Award in the Airport Lounge category for excellence in design. Delta is Seattle's largest global airline with 158 peak-day departures to 49 destinations in September. The airline continues to grow its presence in the market and this summer offered 10 percent more peak-day seats, driven by the addition of three new domestic destinations – Indianapolis, Kansas City and Washington-Dulles – as well as more flights and larger aircraft operating between existing routes.